Passiflora edulis, also known as Passion Fruit or Passionflower, is an intricate and beautiful flowering vine native to the Americas. Native variants of passionflower can be found throughout North and South America, but it is cultivated around the world in tropical and subtropic areas for it's unique and highly prized edible fruit, foliage, and flora. The fruit is often made into delicious juice or eaten raw. 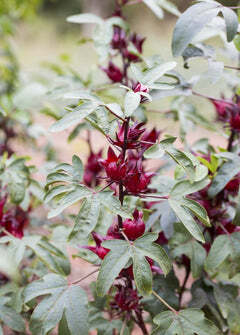 This plant has several medical properties which make it a great addition to any herbalists garden. This Purple Possum passionflower is a special edible and ornamental variety of the vine plant, which often yields large purple and deep blue fruit. Fruit has a tangy-sweet flavor, and each piece is filled with juicy flesh and soft seeds. The plant has fast creeping vines and is perfect for porches, decks, fences, and trellises! Some of the purported medicinal uses of passionflower and it's various species include for the treatment of anxiety, depression, and mood regulation. This is due to the fact that the plant is a mild MAOI (mono-amine oxidase inhibitor). This is perhaps it's most common and well researched use. Soil & Moisture: Passion fruit vines require an average watering regimen and prefer light, sandy, well-draining soils rich in organic matter. They love water but can also be drought resistant. Climate Zones: USDA plant hardiness Zones 9-11 with frost protection in Zone 9.